They are all rather uniform aren't they! Used to be, even when I was at CH, that grade 4 was the minimum on the back, and 8 on the top. Anything less and you could be sent home till it grew! We used to have to have our hair cut by the barber behind the tuck shop; big guy with a wooden leg. No choice of cut of course, just short back and sides and out the door. John Rutley must remember. Rod Stuart wrote: We used to have to have our hair cut by the barber behind the tuck shop; big guy with a wooden leg. No choice of cut of course, just short back and sides and out the door. John Rutley must remember. We used to try and skip off, getting someone else to sign the book. I think you must be correct on the date Rod, coz I'm not in this photo. I started January 1958. The only person I recognise is Guy Shorey, who is a year older than me. When I first went to CH, the only silver plaque was that for the RMS worn (as shown in the picture) on the left shoulder. However, during my time there (I think) the RAF - Barnes Wallis - plaque arrived. Now there appear to be many more and I notice that they have migrated from the shoulder to the left breast. Why and when did this happen? I seem to remember about four plaques, Dave, including the two you mention, but can't recall what the others were. Another name has just dawned. 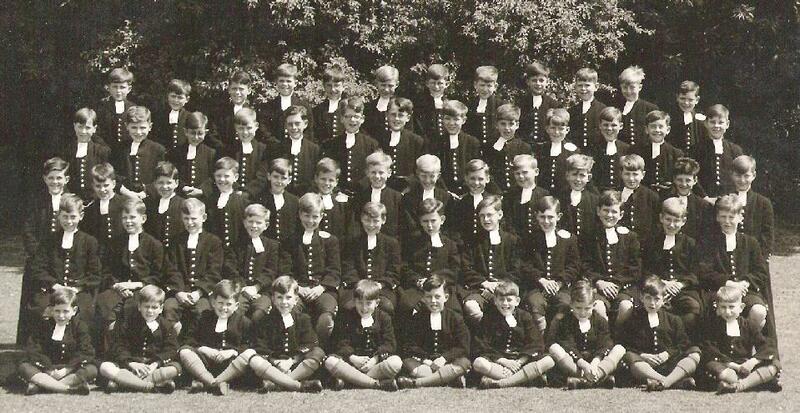 There is at least one future SG in this pic: Frank Hunter (SG 65/66 I think) is seated 4th from right. A couple more names for you. Haircuts: When I arrived in the Prep in 1946 and for a while thereafter a creature called the Sheepshearer used to go round the houses cutting hair in the bootroom, short back and sides. It would not have occurred to us to ask for a particular style. He was replaced about 1950 by a pair of professional barbers (well, at least they had more kit than the Sheepshearer) who set up in the Court Room annexe. I can't recall there was any idea of a choice of style. That's all modern stuff, teenagers hadn't been invented then. The results can be seen on the Col A house photo series in the shot of the Dining Hall. The drill was that a monitor would walk down the long table telling anyone who needed a haircut to go and get one. Brylcreem was popular and worn to excess on Confirmation Day in order to gum up old Bishop Bell, the one who had been against bombing the Germans quite so hard (traitor! - and spoilsport). Plates: there was a Stock's Gift plate (one or two only) and one other. In 1954 when I got my buttons down came my RMS plate (which, as a 'volunteer', I hadn't had for long). The plate went back into circulation via Matron & the wardrobe presumably. I now see that Grecians continue to wear their plates. Indeed they have moved downhill, one of those creeping changes I suppose like Grecians buttoning their cuffs. postwarblue wrote: Plates: there was a Stock's Gift plate (one or two only) and one other. In 1954 when I got my buttons down came my RMS plate (which, as a 'volunteer', I hadn't had for long). The plate went back into circulation via Matron & the wardrobe presumably. I now see that Grecians continue to wear their plates. Indeed they have moved downhill, one of those creeping changes I suppose like Grecians buttoning their cuffs. Some plates were always retained by Grecians, the RAF one for instance. It was mainly the RMS plates that for historical reasons had to be given up. Grecians were in the "Grammar School" in the London system, so they couldn't be simultaneously in the Mathematical School. postwarblue wrote: Haircuts: When I arrived in the Prep in 1946 and for a while thereafter a creature called the Sheepshearer used to go round the houses cutting hair in the bootroom, short back and sides. Well done Robert, that brought back a few memories... I thought the barbers name was Sweeney Todd but as I have said before, your memory of this period is far better than mine. 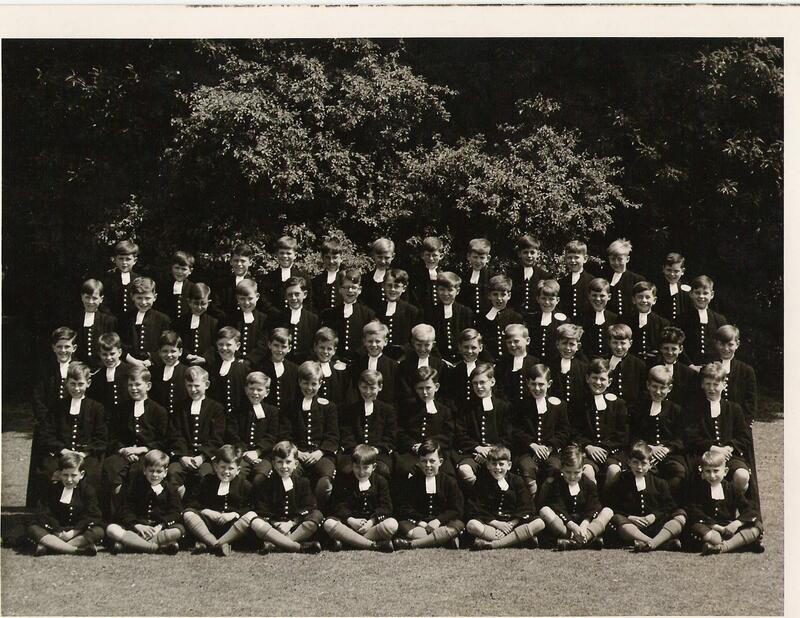 Is there anybody with a Prep B photograph of the 1946/8 era?